In a sluggish system body tissue becomes the dumping ground for excess toxins, acids, metabolic waste, heavy metals, medications, chemicals, preservatives, pollution, pesticides, etc. What does WEGA MRT do? WEGA Matrix Regeneration Therapy (MRT) loosens and removes trapped toxins from your body tissue, stimulates the immune system and enhances your body’s own healing ability to regenerate damaged body tissue. 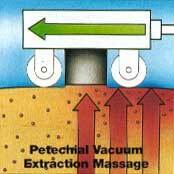 The treatment is done in a 15 minute session during which the instrument – consisting of two rollers with a suction probe and electrode attachments – is glided over the skin on your back. Treatments are usually very comforting and relaxing with long lasting effects. 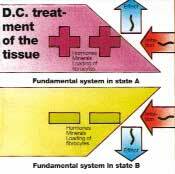 The positive and negatively charged rollers draws off excess charge from diseased tissue via a weak current. This works like old school cupping technique by drawing toxins to the surface. The WEGA MRT unit records the charge from your body as well as information from toxins drawn to the surface. These pathological frequency patterns are then transformed by the MRT unit, into therapeutic signals individual to your body’s current state of health, and returned as therapy to the body via large rollers to initiate your healing process. WEGA MRT leaves red lines on the skin where toxins have been drawn out, allowing the skin, your biggest elimination organ, to further assist in releasing toxins. It is therefore important to drink plenty of filtered water after a session. Further detoxification may come from having a warm bath before bedtime, with 2 cups of Epsom salts added to the water. This bath is not suggested if you suffer from high blood pressure. WEGA Grieshaber KG is certified under ISO 9001 and thus ensures uniform quality and safety. The equipment also carries the FDA and CE mark. This equipment is internationally tested and approved. Contact Dr Sonja to talk about how WEGA Matrix Regeneration Therapy (MRT) can be beneficial to your health and well being. Phone 0434 726 2141 or send an email.